A 15-Year-Old High School student and his company, Sports Guidance Technologies, is developing and launching a comprehensive sports training developer’s tool kit which will give professional, college, and high school athletic coaches and players of all sports a decisive advantage. The system will enable professional, college, and high school coaches to achieve a new level of excellence for their teams and players. Yijin (Jake) Huang, a 15-Year-Old High School student, is the co-inventor and developer of hardware, software, and tool kits that aim to revolutionize future sports training. Sports Guidance Technologies (SGT) is a division of Wearable Networks, LLC. This company is developing and launching a comprehensive sports training developer’s tool kit which will give professional, college, and high school athletic coaches and players of all sports a decisive advantage. According to Jake, “the system will enable professional, college, and high school coaches to achieve a new level of excellence for their teams and players.” The system will provide coaches, trainers, and serious athletes of all sports (basketball, soccer, football, hockey, etc.) a new competitive advantage. SGT identifies the relationships between biostatistics and performance statistics. These relationships are then translated to adjustments in a player’s techniques, routines, and overall physical activities on and off the court in order to maximize performance and maintain a peak level of physical ability for as long as possible. With this technology, “we are truly breaking sports down to a science,” says Jake. According to Jake, “Not only does my passion come from sports and from my hard work as a basketball guard for Marquette high school, but it also comes from envisioning the expanding role of technology in the future of sports. I have never been the player with the most athleticism or natural born talent, but I attribute the successes I’ve achieved in basketball to dedication, hard-work, and smart training.” Mike Saigh, the co-inventor and developer of wearable training technology, believes that this project will be a great contribution to the sports community. St. Louis, Missouri (March. 18, 2016) - SPORTS GUIDANCE TECHNOLOGIES, the patent holder and developers, introduce the next generation of smart sports logistics, software, and network wearable solutions. These technologies, developed by Mr. Huang, Mr. Saigh and their team, are to be released in the spring of 2017. Our company has close relationships with physiologists, hardware and software developers, scientists, professional trainers, schools, and other companies. 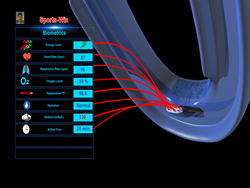 Please visit the company’s website at http://www.sportsguidetek.com/ for additional information. Phone: 314-4530858.